During my study in Linguistics, I became interested in signed languages, a topic that still fascinates me. After obtaining my MA degree (1996) from Utrecht University, I was involved in constructing a language course for deaf pupils in primary education. My subsequent PhD study focused on classifiers in Nederlandse Gebarentaal (Sign Language of the Netherlands) and I graduated at the same university in 2003. During that period, I was also employed at the Research Department of one of the institutes for education and care of the Deaf (Viataal). My research there focused on sign synthesis. 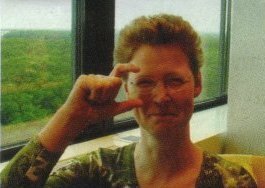 In 2006 I joined the Sign Language Research Group at the Linguistics Department of Radboud University Nijmegen. My collegues and I constructed a corpus of more than 70 hours of videodata from Nederlandse Gebarentaal (CorpusNGT). From 2007 on, I have also been affiliated with the Nijmegen_Gesture_Centre at the Max Planck Institute for Psycholinguistcs. As a postdoc researcherI am currently involved in a project that compares manners of reference in two unrelated sign languages: Turkish and German Sign Language (TID and DGS), as well as reference in co-speech gesture in Turkish and German as well as a project on interaction (PI: Dr. Asli Özyürek), where the structures of conversations holding question and answer pairs in NGT are compared with those in ten unrelated spoken languages (PI: Tanya Stivers). Shortly, I will join a project which studies the "other" hand in Nederlandse Gebarentaal in several linguistic domains (PI: Onno Crasborn). My main interests are: use of space (especially classifier predicates) in referencing, morphological processes, and the relation between phonology and morphology in signed languages. Besides that, I am very interested in (applications for) learning and teaching signed languages as a second language.